Apple has released beta 4 of iOS 11.1 for users enrolled in the beta testing programs. The fourth beta release of iOS 11.1 comes just several days after the third beta build of iOS 11.1 was issued. 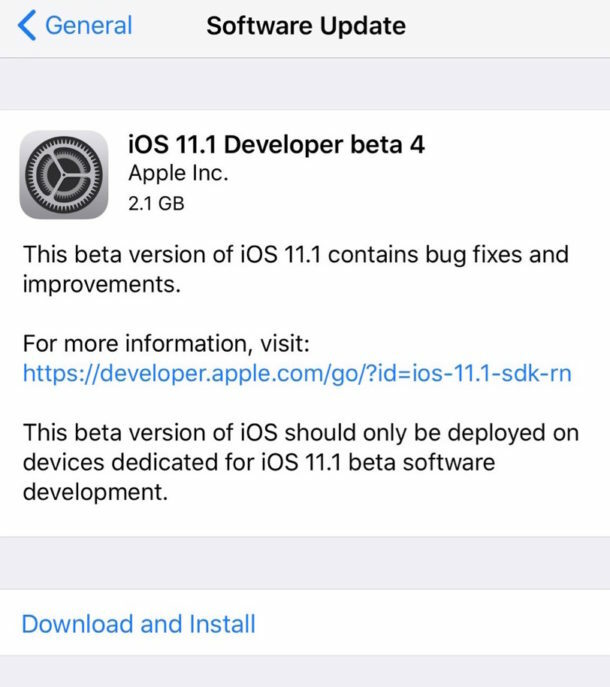 Users enrolled in the iOS beta testing program can find iOS 11.1 developer beta 4 available now via the Settings app Software Update mechanism. The corresponding public beta version is likely to arrive soon. iOS 11.1 beta focuses on bug fixes and feature enhancements, as well as security updates. It also returns the 3D Touch multitasking access for iPhone users, resolves an issue with Reachability on iPhone, and includes hundreds of new emoji icons, including a pie, vampire, avocado, fortune cookie, mermaid, pixie, a bearded person, breastfeeding woman, gender neutral figures, a wizard, dinosaurs, an I Love You gesture, and many more emoji characters. Separately, Apple has released watchOS 4.1 beta 4 for Apple Watch users as well. Apple usually goes through multiple beta software updates before issuing a final version to the general public. Though no timeline is known for the final release of iOS 11.1, it is rumored that iOS 11.1 will be released to the general public near when the iPhone X becomes available in November. Currently, the most recent final version of iOS 11 remains iOS 11.0.3.
already installed and already can tell that battery life is still crap.